It's Time to Find Food Freedom and Enjoy Life's Pleasures! 1.) Preheat oven to 375 F. Spray baking sheets with cooking spray and spread out butternut squash, mushrooms, and onions and peppers. Drizzle with a little olive oil and whatever seasonings you’d like. Bake for about 25-30 minutes or until soft, moving veggies around every so often. Keep an eye on the mushrooms, which cook quicker! 2.) Cook lentils in a small sauce saucepan by combining 1 cup dry lentils with 2 cups water. Bring to a rapid simmer, then reduce to low and let simmer for 20-30 minutes or until fully cooked. Add a little salt and remove from heat. 3.) 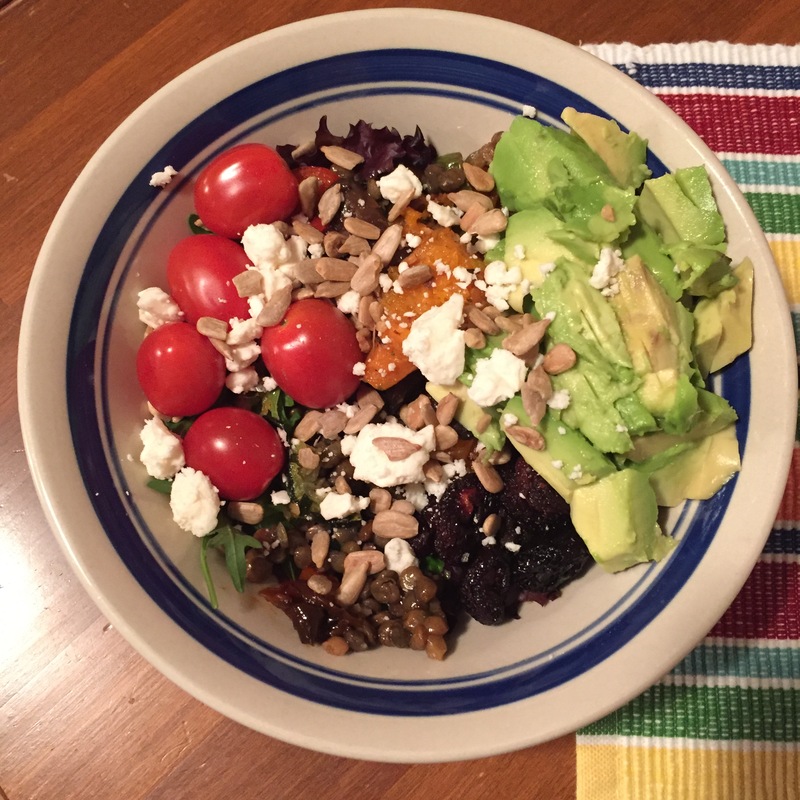 Assemble salad in a large bowl: add 1 cup salad mix, top with about 1/2 cup lentils and 1/3 cup veggie mix (heated if you’d like), then top with 1/2 an avocado sliced, a handful of cherry tomatoes, and 2 tbsp each of sunflower seeds, dried cherries, and cheese. 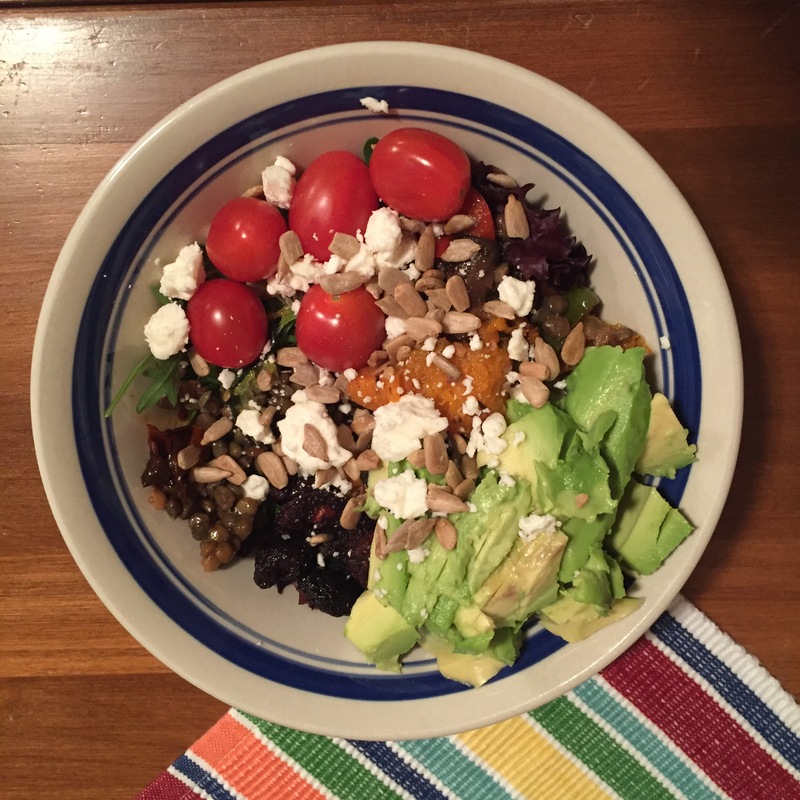 Drizzle with dressing of choice and enjoy! Chocolate Overnight Oats – 2 Ways!